Oh Strawberry Chicken Wrap, has it really been 10 years? Saturday the 17th of March will be the official 10th anniversary of the re-opening of Wanamakers General Store, and as has become tradition we will start offering our most popular wrap for its limited season… the Strawberry Chicken wrap. This is a wrap that people order four of in one sitting. This is a wrap which changes, dramatically, what we put on our weekly orders. Normally we would get a tub of feta once a month… we will be ordering two tubs weekly. Normally we order one case of spring mix a week… now we’ll order three or four. There will be a tower of strawberry flats in the walk-in. Why, we wonder, is this wrap so beloved? Is it that it seems to signal spring? Is it because balsamic glaze mixed with mayo is just so darn good? After mulling it over I think it’s because we only offer it for a short three months each year. One of our goals at the store is by keeping things seasonal and local we can reduce our impact on the environment in a real way- not by talking about it, but by living it. 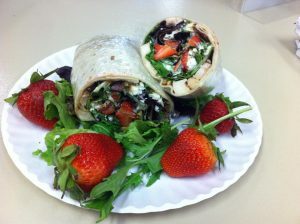 We could think- OKay, the Strawberry wrap is super popular let’s sell it year round and make lots of money! But instead our commitment to local and seasonal shines through and appeals to our customers. By respecting the rhythm of nature in a small way something primal is satisfied in all of us. Perhaps primal is a strong word, but if we developed over millions of years living seasonally it makes sense to me that when we honor the seasons we are met on a level deeper than the immediate gratification of always having what we want when we want it. Not to get too carried away with this… we will be ordering strawberries from Florida while we wait for Schmitd Berry Farm http://www.schmidtberryfarm.com/ in New Tripoli to grow us some in order to scratch that Chicken Strawberry wrap itch starting this Saturday March 17th 2018! 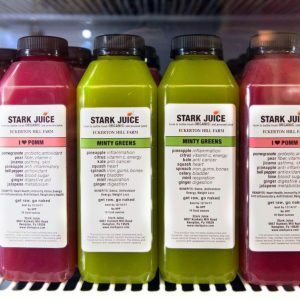 In addition to kicking off the Strawberry Chicken wrap season, we will be celebrating by offering samples of some other really cool local products. 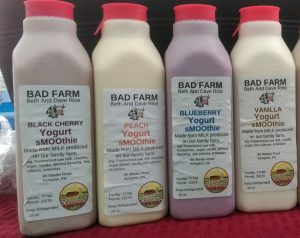 So stop by and snag a taste of Bad Farms smoothies https://www.facebook.com/BAD-FARM-1536713073239763/, Stark Juice juices https://www.facebook.com/starkjuice/, and Portch Tea kombucha https://www.portchtea.com . 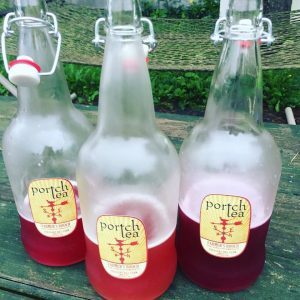 We are so excited to be adding these delicious products to our local repertoire. And of course a big shout out and THANK YOU to all of our loyal customers, because without all of you we wouldn’t be here to celebrate ten years! !